Maarten Van Severen's Kartell LCP Chaise Lounge is a modern transparent design seat in PMMA plastic by the famed Belgian furniture designer. A great example of modern simplicity, this sculptural chair is available in a wide variety of colors. The Kartell LCP is a lounge chair is formed from a single mould of clear acrylic plastic which folds back on itself in a spiral to create a radically innovative lounge chair. Only exclusive technology has allowed such flexibility, thus preserving the purity of the articles shape. Maarten Van Severen designed the Kartell LCP Chaise to be elastic, soft and resistant even if it exudes an intangible and evanescent quality. 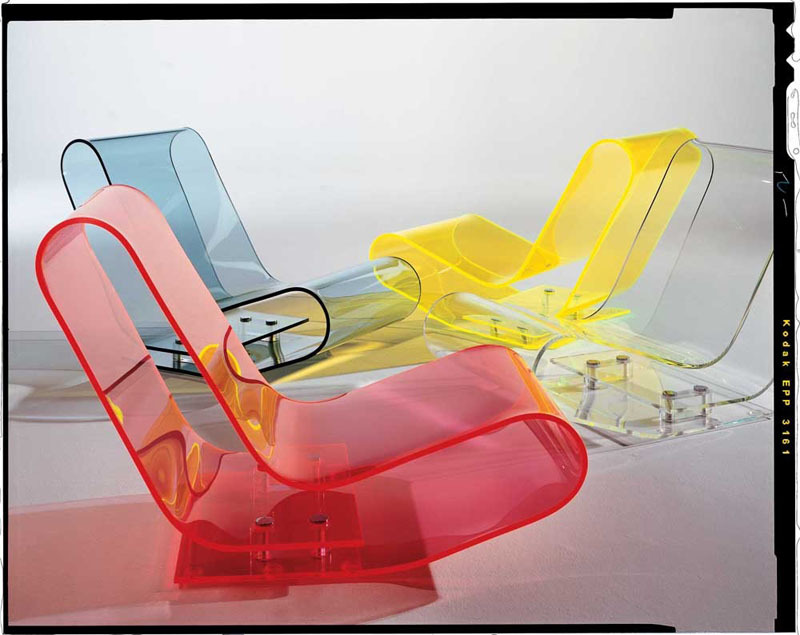 The Kartell LCP Chaise Lounge Chair is available in 4 transparent colors: clear crystal, yellow, clear azure and orange. It is an outstanding and sophisticated chair for the most perceptive connoisseurs of design. Price is for 1 chair.